"Very Useful for Guys Struggling to Attract the Best Women"
Some more abstract examples less useful, Daxx's input good but not as strong as Braddock's, high price. Great interview, covering an important subject. Highly recommend guys wanting to master dating and date the highest quality attractive women to study. This is one of the best episodes from Love Systems' interview series. It adds content and important details that aren't in its other products, like Magic Bullets, and it is overall very good quality and highly effective advice. This is an advanced level product. If you haven't already got experience and studied basic material, this won't be useful to you - you won't be apply to implement without a good set of understanding and experiences of meeting and attracting women. Doing takeways and setting boundaries are a form of setting the respect level you will get from women and men alike. In this interview, obviously, it focuses on women, however the skill is also relevant for your life in general, from friendships, social circles to your career. 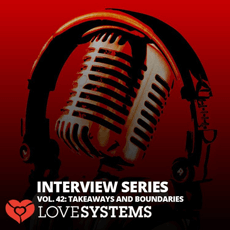 Takeaways and boundaries are nothing new to dating advice, however the detail, subtleties and and frameworks added in this interview make it a fresh and more powerful subject. They really cover it well. The amount of detail in the techniques, examples and mindsets that is given from this hour and a half long audio interview is excellent. For someone who already has a good basis of knowledge and experience, they should be able to implement what is taught with some trial and practice and listening to the audio a few times to make sure they get it. The trial and practice will serve primarily for you to learn to calibrate the use of the techniques in the right situations, and at the right moments. Braddock and Daxx talk about this quite a bit in the audio, but they obviously don't cover all the situations you will be faced with. So your job with implementing this will be getting a feel for the right situations to apply it and which approach to take from the ones advised by Braddock and Daxx. Having said that, the many many examples given from the experiences of the coaches really bring this interview alive. It will give you a great start in getting the feel for when you should apply boundaries. If there are some situations where they discussed less, it is in 'relationships' where boundaries can play a very important role. The audio interview was already longer than usual, but it's a shame that more examples of this topic in relationships weren't given - that would be extremely valuable - we have yet to find and review anything that covers that specific topic very effectively yet. Setting boundaries and doing takeaways is most powerful with girls that you find harder to attract, so the more beautiful, and higher quality girls you are interested in, the more relevant it becomes. If you use these techniques with girls that already like you, then it is really overkill. It can be relevant from time to time, but isn't as necessary. So - the ideal time for you to study this is when you are getting success with women, but not the best ones - the ones that you really like and see as higher quality. If you find that these types of women are getting disinterested in you after a good early interaction, and maybe even being disrespectful to you - this is really a great product for you. I'd strongly recommend you get it. Also, if you have relationships where your girlfriends are giving you a hard time, disrespectful even, then this is definitely something you should study also. Some of the examples given by Daxx aren't as good as the rest. At one point they generalize a bit when talking about the subject, by using examples of a silly nature - for example, asking a girl whether she likes cats or dogs and then using the techniques from there. The question isn't a good example of something you should use, it would've been better if they used real examples throughout to make sure they don't mislead anyone. To be clear, it was easily understandable, but for less experienced people it would've been better to have clear examples. Daxx overall doesn't offer as strong advice as Braddock. Everything that Braddock discusses is very detailed and to the point. Easily understandable. Some of Daxx's explanations are not quite as clear. I'd recommend keeping this in mind as you listen to the interview. Great interview, covering an important subject for guys wanting to attract and have satisfying relationships with the high quality attractive women. If you want to become a master at dating, this is a piece of the puzzle that I highly recommend you study when the time is right.